Earlier this week I had the opportunity to participate in Dell’s Boston Think Tank for Entrepreneurs and Small Businesses (#smallbizboston) at the Cambridge Innovation Center. Dell billed the session as a chance for business owners, startups and others to come together to listen, learn, collaborate and share. Instead of talking heads, the day was interactive from start to finish, with speakers who realized that they have as much to learn from attendees as the other way around. 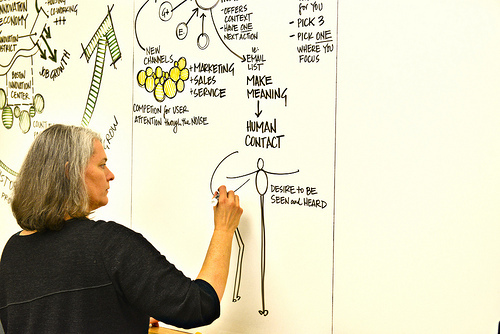 And instead of PowerPoint slides, dpict.info’s scribe captured the story as it unfolded, building this great infographic to sum up the day’s key conversations and insights. Struggle to find qualified people who are also a good fit for the company’s culture. Although small business owners believe that talent and expertise are the most important contributors to business growth, they find it difficult task to access the talent they need. The investment required to recruit, hire and train someone looms large for small business, and the risk of hiring someone who doesn’t work out is a big one. While people have had success outsourcing smaller jobs to contractors via sites such as Elance, TaskRabbit and Zirtual, “you reach a point where you need talent that you can trust, commit to and hire.” Practical advice included to “go where the talent is,” for example, check out http://www.meetup.com/ and go to meetups where you’re most likely to find the types of people you’re looking for, and learn some of the lingo they use so you can engage in a meaningful conversation. Other suggestions included writing down and codifying your corporate values so that you can clearly articulate them to the candidates you interview. Finally, look for people with complementary skills to yours, and those who can do the job as well or even better than you can. See technology as both a blessing and a curse. One the one hand, the Internet and mobile solutions have made it much easier for people to collaborate and connect. On the other hand, small business owners are in information overload when it comes to sorting through all the thousands of available technology solutions and determine which can really help them achieve their business goals–growing revenue, being more productive, and operating more profitably. Dell’s survey indicates that 41% of Boston small businesses see technology needs as becoming increasingly complex, yet only 1 in 10 have full-time dedicated IT people. This mirrors SMB Group’s North America research findings. Most small businesses see the value of technology in making their businesses successful, but need a lot of help to identify which solutions will have the biggest impact on business results. Typically pull their businesses up with their own bootstraps. Only 3% of Boston small businesses relied on venture capital and angel investors to get off the ground. Personal savings are the top source of funding at 44%, followed by banks and credit unions at 23%. Amy Millman of Springboard Investors, which has funded a raft of innovative start-ups, including Zipcar, iRobot and Constant Contact, gave business owners insights into what investors are looking for. First, you must be able to clearly articulate how your company is going to make money, and “learn the language of funders and investors”. More pointedly, when a prospect says “wow”, take it a step further. Find out the “why and how of the wow” and use that in your pitch to investors. Need to get more strategic about using social media. According to Chris Brogan, who led the social media breakout, all businesses must think like “fledgling TV stations and create their own media” and “build trust at a distance.” The challenge is how to do this effectively. SMB Group’s 2012 Social Business survey indicates that of the 53% of small businesses using social media, less than half use it in a strategic way. According to Chris, small businesses need a home base, such as a web site or blog, and two “outposts.” One outpost should be the social media site that’s the best fit for your story and how you want to tell it (I would add that it also needs to be a place where your prospects hang out) and the other is email marketing: bad email marketing may be dead but good email marketing isn’t. Don’t try to spread yourself too thin–concentrate on using these three to help you “articulate, reach, trust, engage and echo” to meet your business goals. Overall, the interactive format, access to experts and eclectic mix of small business owners added up to an event that gave attendees information and inspiration, and new connections with people to get help from and vice versa. Dell put a lot into the event. In addition to Ingrid and a number of Dell marketing and AR staff, Dell product strategy, management and technology teams were also well represented. With its listening ears on at events such as this, Dell is taking the right steps not only to help small businesses succeed, but to also ensure that it has the insights it needs to provide small businesses with the solutions they need to move ahead. The Boston event was the last stop on Dell’s inaugural Think Tank tour of nine cities, but I’m told that Dell intends to follow-up with a new tour schedule soon.